Here’s the stuff I recommend. The number one question I’m asked is “What’s the ___________ that you use?” It could be “camera,” “tripod,” “teleprompter,” “mike,” or any number of other things that confound my students and clients. Here you go: my entire home video studio set-up, along with (mostly) Amazon links to get each of the items listed at a nice discount. Items are divided into major categories by tabs below, like hardware, software, adapters and the like. I hope you find what you’re looking for here – if you don’t, leave me a comment below and I’ll post other items I use. And if you don’t see what you’re looking for, drop me a line at david@camerareadyu.com and ask. I shoot almost all my videos with the iPod Touch (except when I’m using a teleprompter, and then I use the Canon, shown below), a device that not only sports two world class cameras, but allows me to transfer the video I’ve shot, via WiFi/Bluetooth, right to my Macintosh for instant editing (in Screenflow, listed below in Software). Sure, I could get a dedicated camera with all kinds of bells and whistles, but this is all I need. I have three of them that I often shoot with, all at the same time, at different angles, to give me editing options. 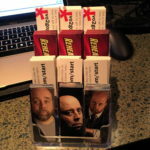 Added bonus: they’re less than half the width of a deck of playing cards. Click here for more information. When I’m using a teleprompter, I switch from the Apple iPod Touch to the Canon VIXIA HF R80 camcorder. It’s a great product, and it has everything you’d need for a shoot, including something really important for using the Parrot Teleprompter (listed below): the ability to accept threaded, front-of-lens mounting. The image is great, it has just the right amount of options in terms of exposure and focus, it records on SD cards, so transferring to my Mac is easy (although nothing’s as easy as AirDrop on my iPod Touch). This is one of the coolest devices I’ve found for use in scripted video recording. It’s lightweight, so it’s portable, and it’s well made and does exactly what I want. Combined with PromptSmartPro teleprompter software (listed under the Software tab above), it’s the perfect combination, and it won’t break the bank. I use my Canon VIXIA camcorder (listed above) when I use the Parrot, as it requires a typical step-up ring to mount, and it doesn’t mount on the iPod Touch. You’ll need the Neewer Step-up Adapter Ring Set, listed above in the Adapters/Cables tab. I have three of these, so I can set up all three of my iPods for various angles simultaneously. I love the pistol grip head – no long bar sticking out to run into. This tripod is inexpensive yet sturdy, and accepts any camera mount or cell phone clip (listed below). [Click image to enlarge] Wait…a professional two-point LED lighting setup, that’s dimmable, and comes with stands? Yep. And it’s just over $100? Yep. And it won’t heat up my room like traditional incandescent, halogen or fluorescent lights will? Yep. If all you need is a two-point lighting system, this is the best bang for the buck. I set one up closer to me for my key light, then dim the other, and place it on the opposite side of the camera for my fill light. Works like a charm. 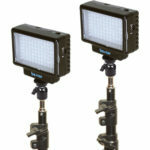 Buy 2 sets for a three point lighting system – and have a spare. 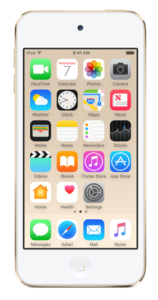 They will run on AC power, but you can also take them outdoors and run them off batteries. If you’re going to use a cell phone or iPod for a camera, you need a mount/clip to snap it into so you can use it with the tripod above (it screws right onto the tripod’s head). Sure, you can scavenge one from an unused selfie stick, but they’re rarely this well built and this inexpensive. When I want to record anything on video, I use the iPod Touch above, and plug in this very inexpensive (but really good quality) lavalier microphone from the same company that makes my go-to narration microphone (listed below). The “iS” at the end of the model number means that it comes with an adapter for iOS devices that lets you simultaneously plug in the microphone and a set of headphones. The output level is a bit low, but easily normalized in your favorite editing software. This is the first MacBook to be manufactured without a fan – and that not only means complete silence when recording, but no distractions when editing video. Sure, there’s only one port (a USB-C one, requiring the MultiPort Adapter listed below), and it requires a powered hub if you want to plug in all your favorite USB gear, but the size, screen quality, full-size keyboard and, most importantly, absence of fan noise makes this the best choice for performers who are recording audio on a regular basis. Quiet, accurate, precise, light, long battery life, programmable buttons and adjustable scrolling speed: this is my go-to pointing and clicking device. Like many inexpensive items, I have two – one on my desk, and one in my go-bag, so I don’t have to pack and unpack yet another item when I travel. I love this keyboard. It comes to life (lights up) when you hover your fingers over it, and features USB charging (yay! no batteries to change!). And…you can instantly switch between typing on your laptop, your tablet, your smartphone and other devices: this is my new keyboard krush. [Click image to enlarge, then the (X) in the upper right hand corner of the image to enlarge further] Because the MacBook is so small, simply placing it on your desk in a comfortable position to view and work with it has one big unfortunate drawback: the built-in iSight web camera is way below your eyeline. That means when you’re doing video (recording, Skyping, etc.) 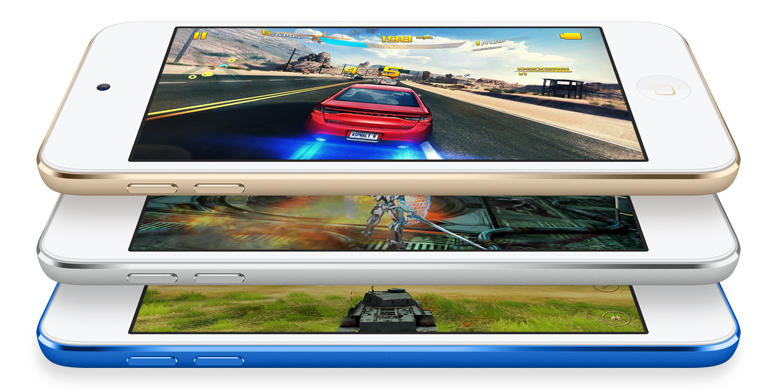 you’re going to look funny – with the iSight shooting up at your face. The fix? 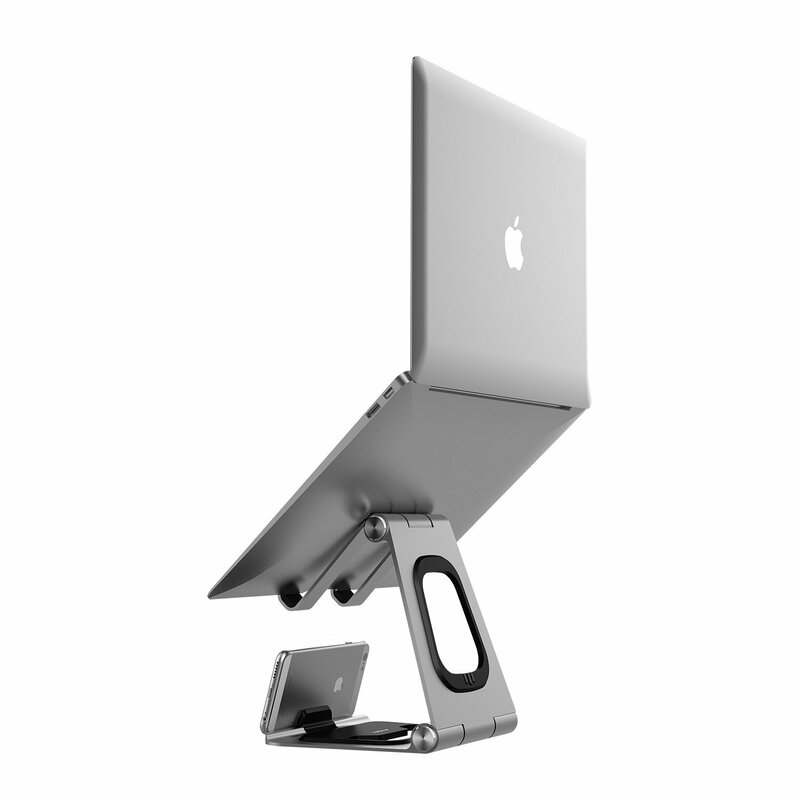 This awesome laptop stand that raises your MacBook to just the right height for video work, and…it’s also easier on your neck when doing everyday work, since you don’t have to look down at an angle. Be sure to pair this with the Logitech Keyboard and trackball above – once on the stand, it’s not at all comfortable enough to use the the MacBook’s own keyboard or trackpad any more than occasionally. [Click image to enlarge] If you go with the MacBook I recommend and use, you’re going to need this device to connect printers, mice, microphones, hard drives and the like that are USB-based. This particular hub was tested by an independent engineer who made sure that the claims made about USB-3 compatibility were true. And they are. NOTE: this item is really popular, and often sells out. 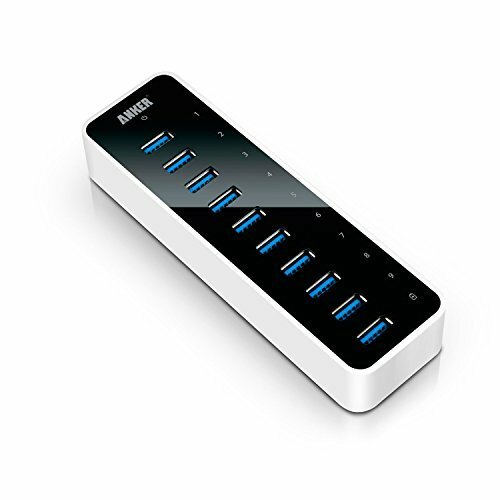 If it’s not available at Amazon, go with the alternative Anker hub listed below. [Click image to enlarge] If you go with the MacBook I recommend and use, you’re going to need this device to connect printers, mice, microphones, hard drives and the like that are USB-based. This hub does everything that the Sentey (above) does, it’s just slightly more boxy, and about the same size. The AT-2020 has been my go-to microphone, both at home and on the road, for over a decade. It’s far less expensive than its quality would dictate, and it’s the only USB microphone with real-time monitoring and a high-end analog-to-digital conversion circuit. I have done nearly all of my audition and production work with this microphone, and I can’t recommend it highly enough. I finally found a source for the perfect athletic sock. 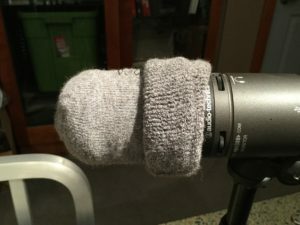 I’ve been using this as a pop filter on my large-diaphragm microphones for years. 100% cashmere, the Mike Sock fits perfectly over the AT-2020 USB Plus. It’s $9 plus shipping. Click here to purchase. Like many inexpensive items, I have two – one on my desk (on my AT-2020 USB Plus), and one in my go-bag (already fitted on the AT-2020 USB Plus I have packed), so I don’t have to pack and unpack yet another item when I travel. 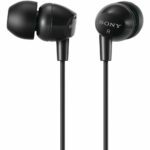 Comfortable and incredibly accurate sound reproduction from an inexpensive set of name brand earbuds? I’ll take that any day – and I’ve done so for more than 15 years. 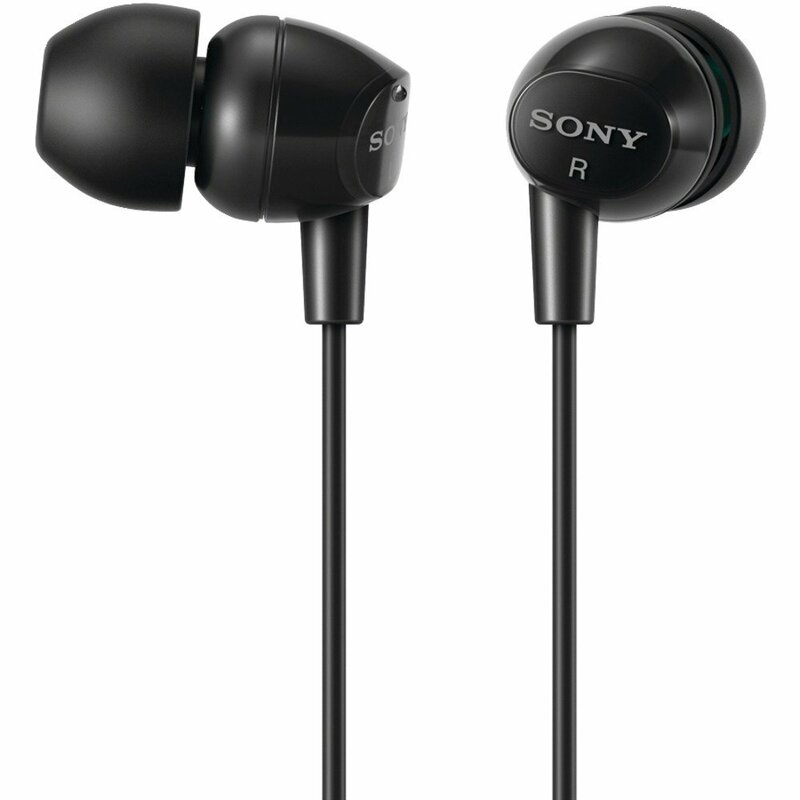 I’ve watched these earbuds drop in price from nearly $70 down to where they are now (price may vary from $10). Click here to purchase on Amazon. If earbuds aren’t your thing, and you really want the heft and solid feel of actual headphones, then I recommend these. I used these exact headphones when I worked in radio for over 30 years, and although I don’t use them now (in favor of the earbuds above), these are the best bang for your headphone buck. This is the drive that I use for extra storage (not for backup – that’s below) – the MacBook has a 512 GB internal SSD drive (again, silent), and that’s not enough storage for all that I do – so this drive is where I store all my data. The only thing that I use the internal SSD drive for is to run applications – they run faster than they would on a traditional hard drive. This is the drive that I use for backup (not for external storage – that’s above), and I have four of them, all in different colors. For a full explanation about why you should clone my insanely over-engineered backup system, click here. Although most Windows users will use Camtasia for screen recording, I absolutely adore Screen from Telestream. This is a company that makes much higher end video editing and broadcast software, and the quality of those products has trickled down to Screenflow, which I use for all of my lessons, presentations and other screen-based production. Here’s the added bonus: the editing features in Screenflow are so easy to use, I haven’t launched Final Cut Pro or iMovie in years. $99.00 with a free trial. Click here to get Screenflow. This teleprompter software is amazing. It works on any iOS device (I use a second iPod Touch), and it has a feature that is really useful for talent that sometimes goes off on a tangent. 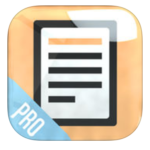 PromptSmartPro uses the voice recognition in your device to scroll the script at the speed at which you’re talking. If you go off-script, that’s OK: it will stop the scroll, and wait for you to get back on track. And it’s cheap at $15 or so. Click here to get PromptSmartPro from the iTunes App Store. 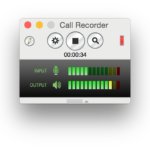 Imagine that every time you have a Skype call (with a client, doing an interview, creating content, whatever) your computer will automatically record both parties in the Skype session, and let you export video and audio of that call. It’s how I create reference copies of my coaching sessions to send to the clients for reviews, and how I interview people for the site. It’s great. $29.95 with a free trial. Click here to get Call Recorder for Skype. Time Machine is the backup software built into every Macintosh sold, and it’s awesome. Here’s how I use it in my insanely overengineered backup system. Learn how to use Time Machine here. I don’t use Windows anymore, but I have a long time colleague, and former Microsoft employee, Leo Notenboom, who absolutely adores Macrium Reflect for backup on Windows ($69). Believe me, if it’s good enough for Leo, it’s good enough for me. Audacity is free, it’s supported by hundreds of developers around the world, and it’s used by more people than any other open-source sound software ever. Audacity records at the same quality level as any other software, including ProTools and Logic, it’s available for Macintosh, Windows and Linux, it’s got a light footprint on your hard drive, it boots up almost instantly, and it’s constantly getting better and better – I wouldn’t use any other software for recording my dry tracks and audiobook work. I do use ProTools for multi-track production (shown below), but for raw single audio tracks, I’m all about Audacity. Click here to download Audacity. For decades, I used Pro Tools for everything: multi-track mixes, demos, commercial production, radio humor, sweetening films and even dry voice tracks. I now use Audacity for voice tracks and audiobook work, but Pro Tools gets fired up every time I produce a demo for a voice over client. I created Rehearsal® Pro to help me manage my acting career, and while I was at it, I added the ability to record and email VO auditions in a pinch. It’s become the go-to app for actors, and it’s great for those quick and dirty auditions on the go. $20, iPhone/iPad/iPod Touch. Not available for Android. Click here for instant access to Rehearsal® Pro. 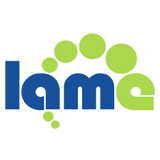 LAME is a free plugin, required by Audacity, and exports MP3s from Audacity at the same quality level as other MP3 exporting software, and it’s available for Macintosh and Windows. Click here to download LAME. 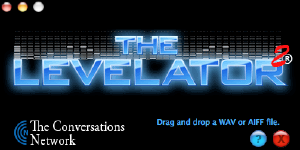 The Levelator is free software, originally created to “level” out the different recorded volumes of participants in podcasts, and just happens to treat raw audio in a way that is completely compliant with Audible’s standards for production for ACX. Drag and drop, baby. It’s available for Macintosh and Windows. Click here to download The Levelator. 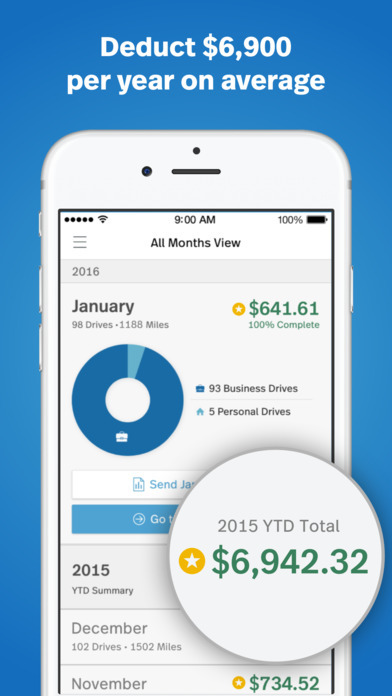 MileIQ helps you automatically record all trips you take, both work and personal. You’d be surprised at how much you might be leaving on the table come tax time, given all the auditions, work, trips to your agent’s office, studios, to get administration done, etc. MileIQ estimates that the average person has $6,900 in mileage/auto deductions each year, and many people let that pass them by. Don’t be that guy (or girl). 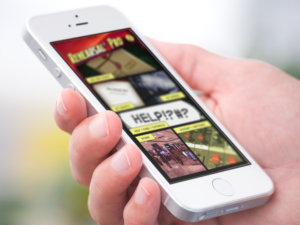 $6 or less per month, free version available for infrequent drivers. Click here to download MileIQ. Strong passwords are essential for staying safe in today’s digital world, but it’s clear that a long, strong password is not so easy to remember. Enter Dashlane, the very best password protection available. There are apps for Macintosh, iOS, Windows and Android – and it’s a snap to use. All of your passwords are both randomly generated, and easily pasted into the password text box of all your login forms. Don’t make the mistake of making your password easy to remember – that usually means it’s easy to crack. Click here to get Dashlane. More of a basic service than actual packaged or downloadable software, Dreamhost is where all of my sites, business and personal, are hosted. All services have good and bad streaks of support and up-time, but Dreamhost has been more reliable than most, and at a cost that is incredibly affordable. And I’ve made a special deal with them (that varies) to give my clients, students and visitors a discount on WordPress hosting. 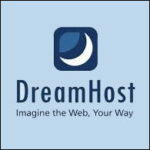 Click here to get Dreamhost hosting at a special discount. 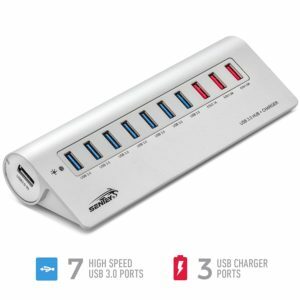 This allows the single USB-C port on the MacBook to accept power, the USB-3 powered hub, and an HDMI display to all connect to the MacBook simultaneously. No more limitations to what you can attach to your MacBook. This allows the Parrot Teleprompter to be mounted to the Canon VIXIA Camcorder (both listed in the Hardware tab above). As the two need to match, this inexpensive ring adapter will do the trick. 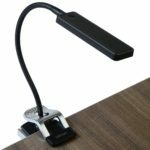 Even though this product was originally designed to allow digital cameras to be attached to iPads and iPhones that use the Lightning adapter, it also works perfectly if you want to attach the AT-2020 USB Plus microphone (or any other USB microphone) to your iOS device for recording. Sometimes, you don’t need anything connected to your MacBook but power, and along with the Apple USB-C Charge Cable above, you can plug right in. I carry an extra one just in case I need to quickly and easily recharge my MacBook. Whenever I perform in a network show, or a studio film, or anything that airs on television, I grab a pristine copy of it using this special cable. Elgato Video Capture can connect and capture video to your Mac or PC from any device that has composite ‘RCA’ or S-Video outputs. It also comes with a SCART adapter, and the files it outputs are in DV format, so they can be imported into and edited with any video editing software. This is how I capture content for and update my on-camera demos. Sometimes, you don’t need anything connected to your MacBook but power, and along with the Apple 29w Power Adapter below, you can plug right in. I carry an extra one just in case I need to quickly and easily recharge my MacBook. 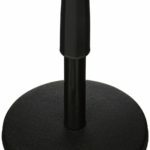 When I teach classes and workshops, instead of a desktop mic stand, I use one of these adjustable (with just one hand) floor-standing microphone stands. To adjust the height of the microphone, you just squeeze the clutch’s grip and up or down you go. Let go when the height is right. It’s lightweight and has a three-legged fold out base. The ultimate in simplicity and utility, this is the classic desktop stand that adjusts in height, is movable to anywhere you need, and is portable for travel. Screw the stalk into the base, and you’re ready to go. Attaching the AT-2020 microphone to this stand (or any other standard stand) might be a mystery, but we solve that mystery here. I’ve called this “the best upgrade I’ve performed all year.” I had a great, comfortable chair – an articulated, fully adjustable, gorgeously designed Aeron-lookalike. $1700. And it was noisy as hell: every joint, every lever, the wheels, the armrests, the back, the seat…everything about it squeaked and clicked and knocked. Then I got this one-piece, welded, all metal chair, and a cushion from the supermarket, and I’ve never looked back. It’s simple. It’s foolproof. It’s absolutely silent. And it was 1/20th the cost of my old chair. Here are the exact moving blankets my Pro, Caroline, used to isolate herself in a portion of an open room, with great results. These can form soft walls around you and your gear for recording, and can be placed on reflective surfaces to reduce reverberance in an echo-y room. Note that this is a 6-pack of blankets. Cheap, hardy and simple. Mine have been holding up beautifully for over three years, protecting the hard drives in them from dust, heat and wear. Get one for each of your backup drives, and one for your external storage drives. 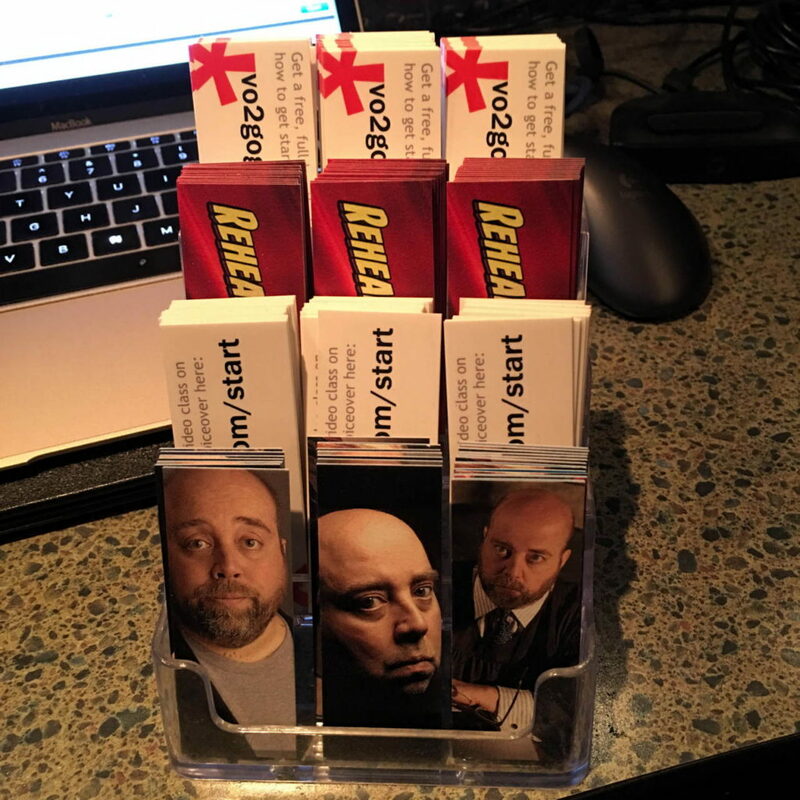 Note: stand not included – you can pick that up at Staples or Office Depot. When I’m depositing checks or snapping images of my script pages with Rehearsal® Pro, these handy little lamps are perfect for those fairly infrequent moments. Having the lights on in the room I’m in cast shadows on the paper I’m snapping, but having two of these, one on either side of the object, throwing light from both directions, lights things up just right. They are cheap, battery operated, dimmable and either stand on their own, or clip to the edge of my studio desk. The book that taught me everything I know about the technical side of on-camera acting, and opened my eyes wide to the ways to control vocal levels and quality. I can’t recommend this book highly enough. When I started listening to this book, I immediately made plans to re-design all my classes, so that students and clients would get the information they needed faster and easier than before. If you present information, this book is a must-read/listen. Greg McKeown could narrate audiobooks if he wanted to, but he’s got an even more important calling in life: helping us all strip out the things we’re doing that are unnecessary, unimportant, and non-essential. His take on life, the focus he has on the things that matter, and the practical methods he outlines to achieve this state are phenomenal. Nightline anchor Dan Harris embarks on an unexpected, hilarious, and deeply skeptical odyssey through the strange worlds of spirituality and self-help, and discovers a way to get happier that is truly achievable. After having a nationally televised panic attack on Good Morning America, Dan Harris knew he had to make some changes. And as I listened to the changes he made, I could instantly identify with all the doubt he was feeling – the woo woo he was being asked to accept. This book helped me tremendously. I was introduced to Lo Han Quo in the 1990s, when being on the air could be a really tricky thing if I had a cold, the sniffles, congestion and the like. I can’t tolerate zinc, but I love this amazing Chinese fruit “tea.” Drop a cube in hot water, sip, and enjoy. Soothes your throat, eases your breathing and tastes really good. I know. I know. 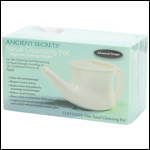 Sounds gross – sticking the spout of this very basic pottery in one nostril, and letting warm, salty water flow out the other nostril, cleansing your nasal passages as it does. An ancient Ayurvedic treatment and preparation, it works like a charm to fight congestion and stuffiness, despite its image. And, it’s cheap. So…now that you’ve seen mine, what do you use that I’ve left out? Leave a comment below and let me know. I’d love to hear your suggestions!